Called by many names, These living filters are used for propagation and protection. What are the basics of a refugium? A fuge is a living filter. The sole intent of a refugium is to dedicate a specific space for the growth and/or cultivation of algae or animals where they can be protected from predation. A very basic refuge would be a hang on back filter. When changing the filter pads, look closely and you will see all kinds of worms, copepods/amphipods. These pods have found that they can live free of fear in the filter pad because fish can not get to them. Thus the basic refuge is born out of a simple hang on back filter and filter floss. As outlined in the section above, a refugium is basically a container that has been set aside for one purpose and one purpose only. Refugiums can be set up as a place to grow macro algae to feed hungry tangs or as a form of natural filtration. Fuges can also be set up as a place to grow amphipods/copepods (pods). Depending upon your needs, you can even use a refuge as a place to keep other creatures that you can’t keep in your main tank. Refugiums can act as living filters to restrict growth of undesirable algae by utilizing the concept of nutrient export with other more desirable macro algae colonies living within the fuge. They an also act as a farm to cultivate and grow pods so as to act like a natural food source for fish and invertebrates. A properly sized refuge can also help balance your tanks PH chemistry via macro algae on a reverse photoperiod. Just like the addition of a sump, the refuge can also add to the total water capacity of the system, making it inherently more stable. What size should I make my refugium? Your refugium can be any size you want, but its suggested by Fenner and Calfo (Natural Marine Aquarium Volume I Reef Invertebrates) that the larger the refugium the more of a benefit one will see from it. A suggestion of 20% of the size of the display tank is given as a way to size a large and productive refugium. A refugium that has a total capacity of 10 gal will be much better suited to a 55 gal display tank than a 5 gal refugium or a refugium of even smaller size. This is simply because of the volume that the refuge can hold. The bigger the fuge the more algae it can hold or the more substrate area you will have to cultivate pods. Having a refuge that is too small can be just as limiting as not having one at all. 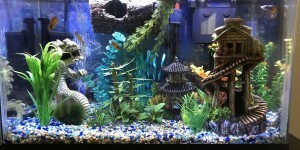 What can I put in a refugium? The most popular use for a refugium is to grow macro algae for nutrient export, PH stabilization, and as a food source for hungry tangs and angels. This is by no means the only use for a refugium. Refuges can also be set up to cultivate plankton or amphipods/copepods. Refuges can also be set up with DSB’s and be the sole source for nitrate export. Let us say you have an established aquarium with a crushed coral substrate and you don’t want to go thru the effort of removing the old substrate and putting a in new substrate. Adding a somewhat large DSB refuge will provide for a means of nitrate export. To have a viable DSB refugium its suggested sizing your refugium at no smaller than 20% of your tank volume but ideally the larger the better, the depth for a DSB refugium should also be between 4-6. If you’re using the refuge as a nutrient export device, then you will need to light the refuge just like you would your display tank. The macro algaes you want to grow need proper lighting for photosynthesis. Ideally you should light your refuge on a reverse day/night cycle from your main tank. What this means is that while your tank is lit the refuge is dark and when your tank is dark your refuge is lit. The purpose of this is to provide a continual CO2/O2 exchange, thus maintaining a consistent PH level within the tank. If you want to provide a pace for pods to thrive then you need to provide an ideal living environment. This would first be a place with no natural predators. Second you should have either a thin later of sand or bare bottom and provide a nice mound/layer of rubble rock. Amphipods and copepods will find this kind of habitat desirable. The pods should then find their way back into the tank when they are moving about at night. A pod tank does not even need to be lit. As you can see the exact setup of your refuge will really depend on what you want to keep in it. Think about what kind of task you want your refugium to perform and then design and size it appropriately. How do I incorporate a refugium into my setup? There are two main locations hobbyists put their refugiums. You can either position it above the tank or below the tank. Some hobbyists will put their fuges above the tank so as to keep from chopping up pods’ when they enter the return pump. I don’t believe in this because at some point the pods will have to travel thru a pump either to get into the refuge or to get out of it. Remember my example above about a simple hang on back filter being a very basic refuge. Well no one put those pods in that filter where they found the filter floss to be their home. So that means they had to have traveled up the intake tube and thru the intake impeller to find them a home in the filter floss. If you put your refuge above the tank then you will need to plumb it in such a manner that you have a pump either coming from your sump or from your main tank to feed the refuge and then set up a gravity drain to return water to the main tank. Never try to set up a dual pump system where you have a pump putting water into and a pump taking water out of a system. The problem with such a setup is that it will be next to impossible to maintain a duel pump system operating where both pumps are moving the same volume of water over a long period of time. Putting your refuge below the tank would entail a setup just the opposite where as you have either a gravity feed from the display tank into the refuge and then a pump returning to the main tank or you could have the refuge on a secondary circulation set up feeding out of the sump and back into the sump or back into the display aquarium. How much flow should I run thru my refugium? The flow rate that will optimize your refugium will greatly depend on how you have your refuge set up. If you’re using it for nutrient export then shoot for a turnover rate of five times your tank volume per hour. If you’re using your refuge as a pod farm then you can increase this flow rate to ten times your tank capacity if you want. If you’re using the refuge as a plankton farm then you will probably want a flow rate much lower than even five times the turnover rate. In summary, remember that you’re not limited to what you can do with your refugum and that you can even install multiple refugiums on the same system. The size of the refuge should be as large as you have capacity for and while the flow rate does not have to be equal to the flow rate within your tank, it also does not have to be so low that it could be classified as a stagnant body of water. Please post any questions you have about this article or refugiums in general to our forums.